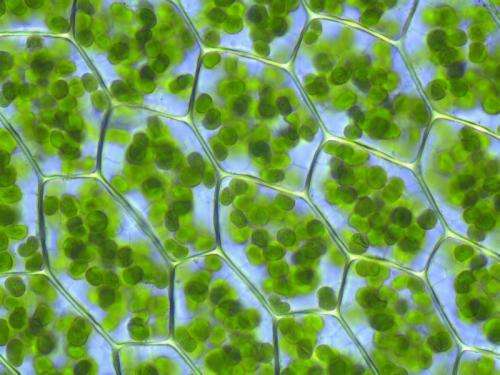 Light-gathering macromolecules in plant cells transfer energy by taking advantage of molecular vibrations whose physical descriptions have no equivalents in classical physics, according to the first unambiguous theoretical evidence of quantum effects in photosynthesis published today in the journal Nature Communications. The majority of light-gathering macromolecules are composed of chromophores (responsible for the colour of molecules) attached to proteins, which carry out the first step of photosynthesis, capturing sunlight and transferring the associated energy highly efficiently. Previous experiments suggest that energy is transferred in a wave-like manner, exploiting quantum phenomena, but crucially, a non-classical explanation could not be conclusively proved as the phenomena identified could equally be described using classical physics. Often, to observe or exploit quantum mechanical phenomena systems need to be cooled to very low temperatures. This however does not seem to be the case in some biological systems, which display quantum properties even at ambient temperatures. Now, a team at UCL have attempted to identify features in these biological systems which can only be predicted by quantum physics, and for which no classical analogues exist. "Energy transfer in light-harvesting macromolecules is assisted by specific vibrational motions of the chromophores," said Alexanda Olaya-Castro (UCL Physics & Astronomy), supervisor and co-author of the research. "We found that the properties of some of the chromophore vibrations that assist energy transfer during photosynthesis can never be described with classical laws, and moreover, this non-classical behaviour enhances the efficiency of the energy transfer." Molecular vibrations are periodic motions of the atoms in a molecule, like the motion of a mass attached to a spring. When the energy of a collective vibration of two chromphores matches the energy difference between the electronic transitions of these chromophores a resonance occurs and efficient energy exchange between electronic and vibrational degrees of freedom takes place. Providing that the energy associated to the vibration is higher than the temperature scale, only a discrete unit or quantum of energy is exchanged. Consequently, as energy is transferred from one chromophore to the other, the collective vibration displays properties that have no classical counterpart. The UCL team found the unambiguous signature of non-classicality is given by a negative joint probability of finding the chromophores with certain relative positions and momenta. In classical physics, probability distributions are always positive. "The negative values in these probability distributions are a manifestation of a truly quantum feature, that is, the coherent exchange of a single quantum of energy," explained Edward O'Reilly (UCL Physics & Astronomy), first author of the study. "When this happens electronic and vibrational degrees of freedom are jointly and transiently in a superposition of quantum states, a feature that can never be predicted with classical physics." Other biomolecular processes such as the transfer of electrons within macromolecules (like in reaction centres in photosynthetic systems), the structural change of a chromophore upon absorption of photons (like in vision processes) or the recognition of a molecule by another (as in olfaction processes), are influenced by specific vibrational motions. The results of this research therefore suggest that a closer examination of the vibrational dynamics involved in these processes could provide other biological prototypes exploiting truly non-classical phenomena. More information: 'Non-classicality of the molecular vibrations assisting exciton energy transfer at room temperature' is published online in Nature Communications today (9 January 2014). Another brick in the anthropic principle? Any other biological process uses quantum mechanics, because in classical physics electrons would just spiral into the nucleus. Actually, if classical physics were true, we would be living in quite a different place! Classical physics is mostly studied in "ideal" systems in textbook physics. Of course things like friction and stretching are noted and discussed, but for the most part examples and concepts are incredibly idealized and simplistic. It was designed to describe the mechanics of motion of ordinary experience, not atomic scale or molecular scale events Newton and others didn't even know existed yet. Of course, there had been a theory of atomic matter for 2000 years, but nobody had proven it was true at the time the majority of work on classical physics was done. Yet biological systems are obviously quantum on at least some scale, because of things like proton pumps and electron pumps. That expresses non-continuous behavior, which is non-classical anyway. "The negative values in these probability distributions are a manifestation of a truly quantum feature, that is, the coherent exchange of a single quantum of energy,"
What??? Crazy definition of a probability! If in a calculation your PC gives you negative probability than there´s is something wrong in the formula. Negative probability does not implies quantum mechanical feature. Also in QM you have positive probability: see discussion of the Klein-paradoxon. Perhaps they meant probability-amplitude, which can cancel and which needs to be squared-modulus to represent probability.